You can set up or edit your email address, but you cannot unregister it. An email address can only be used for one Taobao account. You can set up, edit or remove a mobile number. You must first set up your email address before you can remove any mobile number. One mobile number can be used by up to 6 Taobao accounts, but only one Taobao account can activate the mobile login. In other words, you can only have one account that can be logged in via the mobile, while the other accounts have to be logged in using your ID or email address. 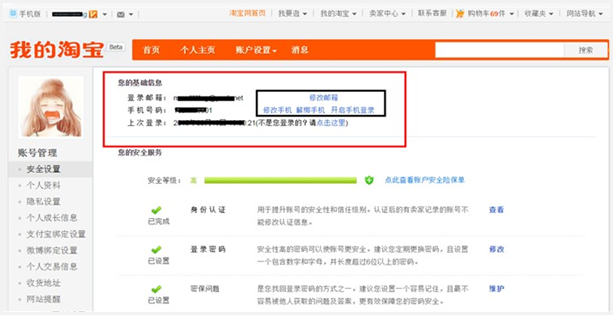 Tip: If you are unable to edit your mobile number or email address, please contact taobao customer service and they’ll be happy to assist you. Hi! I'm Eric,the guy behind howtotao.com.Please feel free to contact me if you have any further questions or concerns regarding taobao. Good News:Taobao Can Ship Directly to Japan without Agent Now! I lost my phone number and I want to remove it or add another one . drop me an email,I will tell you how to to that.